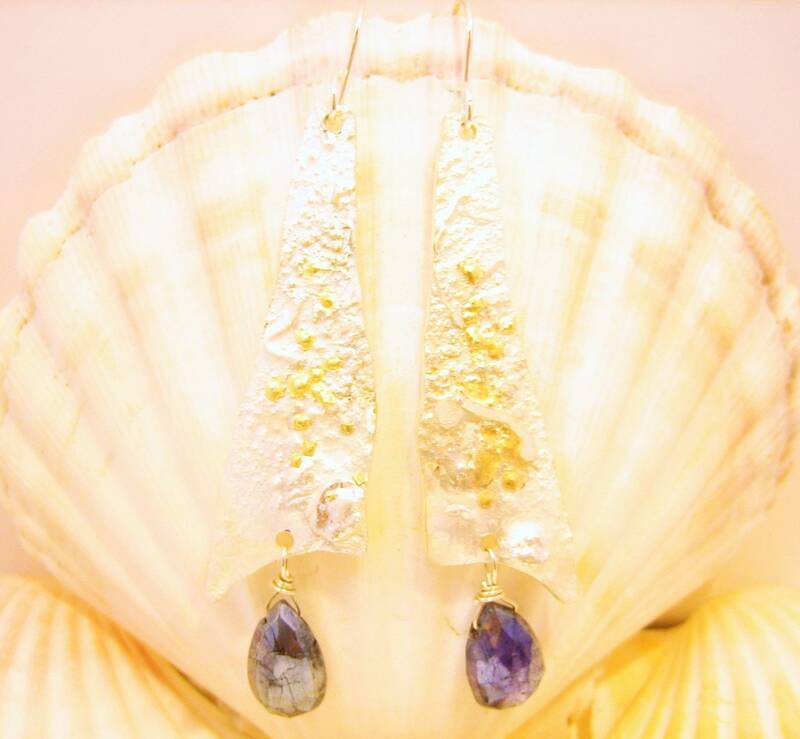 Beautiful bi-metal earrings with faceted rainbow moonstones dangle off of heavily textured sterling silver. Reticulated and washed with bits of 14kt gold these earrings are very lightweight and measure about 2 1/2" from top of earrings to bottom of earring. Super comfortable and look amazing on! French earwires are hand formed of Argentium silver. I use Argentium because it is a purer silver than sterling silver and keeps it's shine longer. Shimmering polished finish. Handcrafted in my sweet Georgia studio. Your jewelry will come beautifully gift wrapped in an elegant jewelry box with a luxurious gross grain ribbon. Please feel free to contact me about any questions you may have. Thanks for browsing my shop! Reticulation is done with a torch and is a process by which metal is made to draw itself into ridges and valleys, creating a unique texture. No two pieces of reticulation are the same and even within the same piece a pattern can be very regular but will never have a true repeat. Argentium Silver is the brand name patented and trademarked by the Argentium Silver Company in the United Kingdom. This modern version of sterling silver contains more pure silver than its traditional counterpart, and its unique combination of metals gives it a natural brightness that makes it outshine gold, platinum and traditional sterling silver. With a tarnish-resistant, durable finish that is free of any plating, Argentium won’t chip or crack. A perfect choice for those who are unable to wear traditional sterling silver.